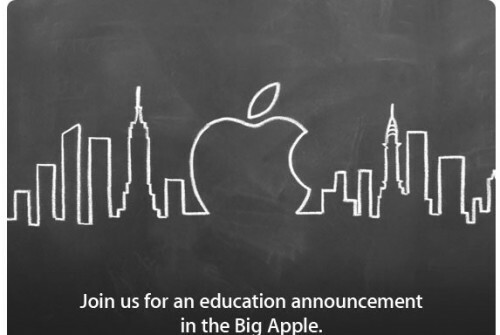 This week, on Thursday, January 19, Apple plans to hold its education-related media event. Last week Apple sent out invitations for the event with a tagline stated that the company would make an "education announcement in the Big Apple." The multiple reports are claiming that the company could announce an initiative to help textbook makers produce interactive ebooks for the iPad, with some sources calling the initiative "Garageband for e-books." ArsTechnica reported on Monday that its sources are claiming that Apple will release a simple app that makes e-book publishing as easy as recording a song in GarageBand. Inkling CEO Matt MacInnis, who worked on education projects at Apple before leaving to focus on interactive e-books, also confirms the rumors, because he dosn't believe that Apple would start releasing content to replace, for example, textbooks, the company is likely to provide content production tools, similar to its own Logic or Final Cut Pro software. "Publishing something to ePub is very similar to publishing web content. Remember iWeb? That iWeb code didn't just get flushed down the toilet—I think you'll see some of [that code] repurposed," MacInnis said. Moreover, the late Apple co-founder Steve Jobs in his biography claimed that he wanted to revolutionize textbooks. ArsTechnica's sources said Jobs had worked on the project for years. "The company is expected to unveil textbooks optimized for the iPad and that feature ways to interact with the content, as well as partnerships with publishers," the Wall Street Journal corroborated the rumors.